Lesley is my person. And my cousin. When her Canadian husband stole her to Toronto almost ten years ago, it was a thing. Luckily, Brian is a very good man. We have survived by never letting 365 days go by without seeing each other. When she called and told me this story a few weeks ago, I knew she had to write a post. This is a SUPER parenting win, and a reminder for all of us that a little bit of prayer and thought goes a long way. I always listen carefully to her parenting stories, since she has been a mom longer than me–three whole weeks longer. She is wise. My seven year old is my sensitive child, deeply aware of everyone’s feelings, especially his own. He’s also a rule follower, like his dad. So, when he steps outside the rules, he is very affected. In this case he was curled into the fetal position on my lap, head buried in my neck, making a confession that was broken and choked with breathy sobs. The whole truth comes out. He tried it at school with some friends that he refuses to identify. They are not encouraging him to say it but he has used this language on the playground. And he confesses that he just said it in our basement before he came up to talk to me. My first concern was that he said it to his younger brother or sister. But he was alone. He could not explain why he said it but he knew it was wrong and came to tell me. It is one of those moments. I need my son to understand that he has made a bad choice and there are consequences. But the only reason I know he used the F word is because he told me. I breathe. Acknowledge that his conscience works. Celebrate that he came to me to unload his conscience. Provide meaningful discipline. There are several feelings in this for me. Pride that he came to tell me, and that he has chosen to keep his friends out of it and only stand on what he did—no deflection to anyone else. Shock that my angel faced boy is walking around using this kind of language. Longing for the days when Mickey Mouse Clubhouse was a part of his present, not his past. What to do? I decide to pull a page from someone else’s Momma-wisdom and use it as my own. I believe that if a Momma shares a bit of wisdom with you, that is implied consent for you to use it as you own. I took this page from Glennon at Momastery. I’m sure she would approve. I tell him “Babe, you know how your heart is hurting and you are so upset? That is God telling you that you made a bad choice and to come talk to me or Daddy. I’m really glad you listened to God. That is hard to do sometimes, but it is very important. He chooses, bravely, to lose his favorite possession—the DS. We spend a few minutes talking about if losing his DS would help him make a better choice the next time. There was not a good answer for that, from either of us. I used my favorite Momma card and deferred a decision until I could discuss with his dad. I believe that bad choices are necessary for good choices to happen. But that can only be true if the consequence includes a mix of humility and a better understanding of the impact of the bad choice. It is not always easy to find a consequence that meets these criteria, but I do think the big lessons are worth a minute of reflection to find one. My son and I had had a big important discussion. It was an opportunity to grow. I knew that losing his DS did not feel like the right consequence. So I percolated, which in our family means I let it bubble gently on the back burner while I went about my business. I have superhero guardian angels who help and guide me. I knew the right answer would arrive. I just needed to make some space for it to come in. Sure enough I became aware of that voice in my head, chewing on the issue. Foul language. Ugh. Garbage. How do I keep my babies from that? And…there it was: If my son was going to dirty the world with garbage out of his mouth, he could pick garbage up to make it clean again. 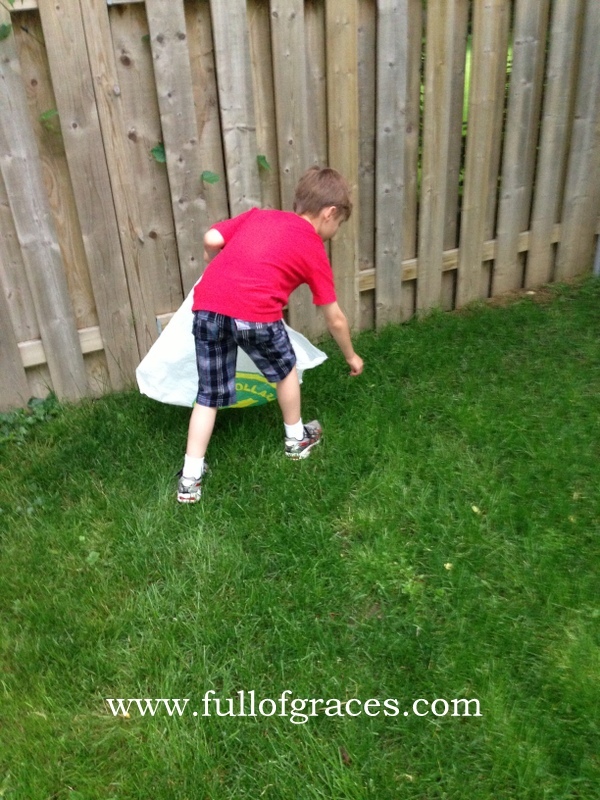 My son spent the week picking up litter all around his school and taking out garbage for his class. It took me a few minutes to write the needed letters. My son provided the letters, with his own explanation for why he was asking to do these tasks. His principal, teacher and after-school care providers were all onboard. Then we talked again about how using curse words makes the world an uglier place. We talked about how some words hurt and why it is important to know what the words you use actually mean. Which, thank God, did not lead me into the definition and explanation of his chosen curse. A man of Honor is honest, fair and has integrity. Most of all he is true to his word, his own principles and is highly reliable. It is a rare but treasured character trait in any man. I knew Brian was a man of Honor as soon as I met him. This incident proves to me that Owen has inherited this character and is himself a man of Honor. Thanks UR. Takes one to know one! Love you! Oh, this is priceless mama wisdom right here. Jen is right! Those moments are heart-breaking in their reality. You done good mama. And thank you for sharing with us so that we can glean some pearls before we have the same (or even close) encounter.